Associate Professor Levinger is a Heart Foundation Future Leader Fellow, and the leader of the Cardiovascular Research Group at the Institute of Sport, Exercise and Active Living (ISEAL), Victoria University (VU). He also is an Honorary Research Fellow in the Department of Cardiology, Austin Health and a member of the Australian Institute for Musculoskeletal Science (AIMSS). He has extensive knowledge, skills and experience in the area of exercise rehabilitation for patients with cardiovascular and metabolic diseases as well as muscle metabolism and cell signalling in humans and maurine models. Overall, Associate Professor Levinger has more than 70 publications. Levinger I, Brennan-Speranza TC, Zulli A, Parker L, Lin X, Lewis J, Yeap BB. Multifaceted interaction of bone, muscle, lifestyle interventions and metabolic and cardiovascular disease: role of osteocalcin. Osteoporosis International. 2017. doi: 10.1007/s00198-017-3994-3. Levinger I, Yan X, Bishop D, Houweling PJ, Papadimitriou I, Munson F, Byrnes E, Vicari D, Brennan-Speranza TC, Eynon N. The influence of α-actinin-3 deficiency on bone remodelling markers in young men. Bone. 2017, 98:26-30. Lin X, Hanson E, Betik AC, Brennan-Speranza TC, Hayes A, Levinger I. Hindlimb immobilization, but not castration, induces reduction of undercarboxylated osteocalcin associated with muscle atrophy in rats. Journal of Bone and Mineral Research. 2016. 31:1967-78. doi: 10.1002/jbmr.2884. Levinger I, Lin X, Zhang X, Brennan-Speranza TC, Volpato B, Hayes A, Jerums G, Seeman E, McConell G. The effects of muscle contraction and recombinant osteocalcin on insulin sensitivity ex vivo. Osteoporosis International. 2016. 27:653-63. Levinger I, Jerums G, Stepto NK, Parker L, Serpiello F, McConell, GK, Anderson M, Hare DL, Byrnes E, Ebeling PR, Seeman E. The effect of acute exercise on undercarboxylated osteocalcin and insulin sensitivity in obese men. Journal of Bone and Mineral Research. 2014. 29:2571-6. Levinger I, Zajac JD, Seeman E. Chapter 15, Osteocalcin, Undercarboxylated Osteocalcin, and Glycemic Control in Human Subjects. In Karsenty G. Translational Endocrinology of Bone Reproduction, Metabolism, and The Central Nervous System. Elsevier. 2013, pp: 181-88. Selig S, Levinger I, Broadbent S. Chapter 3: Exercise as therapy in cardiovascular disease. In Cameron M, Selig S, Hemphill D. Clinical Exercise: A case-based approach. Elsevier: Sydney, Australia. 2011, pp: 29-50. Levinger I, Stepto N. Chapter 6: Exercise as therapy in metabolic syndrome and polycystic ovary syndrome. In Cameron M, Selig S, Hemphill D. Clinical Exercise: A case-based approach. Elsevier: Sydney, Australia. 2011, pp: 84-98. Selig S, Levinger I, Teede H, Deeks A. Chapter 16: Case studies in exercise as therapy for metabolic conditions. In Cameron M, Selig S, Hemphill D. Clinical Exercise: A case-based approach. Elsevier: Sydney, Australia. 2011, pp: 221-37. 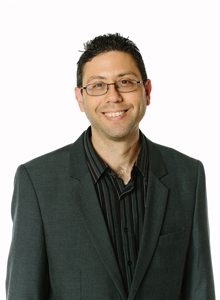 View Itamar's full publication list in the Victoria University Research Repository. Endocrinology & Diabetes Forum (EADF) 2013. Helen Macpherson Smith Trust: Does bone structure and metabolism play a role in the development of diabetes? LEW Carty: Molecular and biochemical characteristics of skeletal muscle in patients with osteoarthritis. DART: Does undercarboxylated osteocalcin involved in increase insulin-stimulated skeletal muscle glucose uptake following muscle contraction? Arthritis Australia: The pathogenesis of muscle inflammation in knee osteoarthritis and its effect on gait and muscle function. Jack Brockhoff Foundation: The inflence of a common genetic variant (ACTN3 R577X) on changes in bone-remodelling markers and the control of blood glucose following exercise training. The Rebecca L Cooper Medical Foundation: The role of osteocalcin in blood vessel disease: A novel approach to fight blood vessels disease.